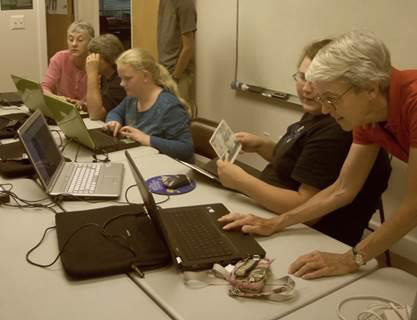 University of Maryland Talbot County 4-H volunteer, Cathy Cooper (far right) is shown guiding members of the Chapel District 4-H Club, plus the Director of the History Society of Talbot County, as they learn Geographic Information Systems for various types of map making. The club is creating a large historical map pinpointing schools and other points of interest within the town of Cordova. Their map will be featured in the Museum’s newest exhibit opening later this fall. Club members were also included in the planning process, collection of photos and stories for the actual display.